If you’re a regular reader of this blog (heck, even if this is your first ever visit to my website) you know I love dogs. I don’t own a dog (YET! 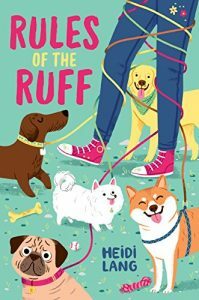 ), but I adore them, which is why I eagerly snapped up an ARC of Heidi Lang’s latest middle grade novel, RULES OF THE RUFF. 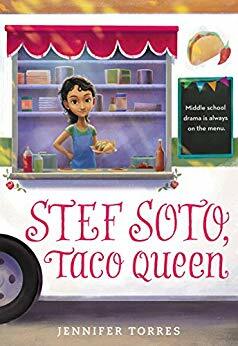 It has everything I love in a middle grade book – family drama, friendships, a yearning for something just out of reach, and a bit of a mystery. Plus, it has dogs. Lots and lots of dogs! Twelve-year-old Jessie is in for a long summer at her aunt and uncle’s house. Her cousin Ann has a snotty new best friend, which leaves Jessie all alone. But Jessie is industrious, and—not content with being ignored all summer—she convinces Wes, a grouchy neighborhood dog walker, to take her on as his apprentice. Sure, dog walking turns out to be harder than she expected, but she has Wes’s dog-walking code, the Rules of the Ruff, to guide her, and soon she’s wrangling her very own pack. But when a charismatic rival dog walker moves to town, she quickly snatches up most of Wes’s business—and Jessie decides she isn’t going to take this defeat with her tail between her legs. Such a fun book! Smart and funny in all the best ways – with a character who doesn’t always do the right thing, but is so easy to root for you can’t help but going along for the ride (or, in this case, the walk). Rules of the Ruff is a realistic look at how sometimes good intentions can lead you astray and how even the worst people may be better than you think. A pitch-perfect age-appropriate sort-of romance. Kinda. A easy-to-relate to main character who is far from perfect. Some subtle lessons on growing up taught through dog-walking rules. Complicated family and friend relationships that will prove to be good conversation starters. Good descriptions of what’s required to be a responsible pet owner from the eyes of a kid. RULES OF THE RUFF is available now. You can pick up a copy online or at your nearest independent bookseller. You can learn more about Heidi’s other middle grade books by checking out an interview I did with her and her writing partner here. One very cool thing about having writer friends is that you get to read their new books before they are released into the world – which is how I got a sneak peek at Wendy McLeod MacKnight’s latest middle grade mystery, THE FRAME-UP. I was lucky enough to befriend Wendy last year, as we navigated the debut author world together. 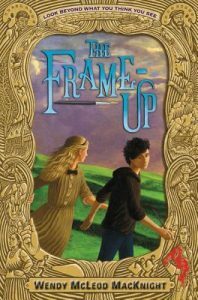 I interviewed her then about her novel, IT’S A MYSTERY PIG-FACE, and got to interview her again last month over at the From the Mixed-Up Files of Middle Grade Authors blog about her latest novel, THE FRAME-UP, a book that quickly became one of my favorite middle grade reads. When Sargent Singer discovers that the paintings in his father’s gallery are alive, he is pulled into a captivating world behind the frame that he never knew existed. Filled with shady characters, devious plots, and a grand art heist, this inventive mystery-adventure celebrates art and artists and is perfect for fans of Night at the Museum and Blue Balliett’s Chasing Vermeer. There’s one important rule at the Beaverbrook Gallery—don’t let anyone know the paintings are alive. Mona Dunn, forever frozen at thirteen when her portrait was painted by William Orpen, has just broken that rule. Luckily twelve-year-old Sargent Singer, an aspiring artist himself, is more interested in learning about the vast and intriguing world behind the frame than he is in sharing her secret. And when Mona and Sargent suspect shady dealings are happening behind the scenes at the gallery, they set out to find the culprit. They must find a way to save the gallery—and each other—before they are lost forever. With an imaginative setting, lots of intrigue, and a thoroughly engaging cast of characters, The Frame-Up will captivate readers of Jacqueline West’s The Books of Elsewhere. One of my favorite reads this year. Wendy McLeod MacKnight blends humor, mystery, heart, and art in this fun and intriguing middle grade novel. Great characters abound – both inside and outside of the paintings. And MacKnight keeps the mystery tight and the plot moving while mixing in just the right amount of relationship/family problems. Clever. Innovative. Great writing. And a fun read. This one is timeless. Humor. It’s funny! Smart characters and great, imaginative situations. Pictures that come to life – and have a life. Art. Lots of it. Real life masterpieces, art theory, and art history come to life in this book. A good depiction of the difficulties of staying with your non-custodial parent. THE FRAME-UP is available now. You can pick up a copy online or at your nearest independent bookseller. I’m celebrating my birthday week by highlighting a great friend and a great book! (Bonus, this friend also shares a birthday month with me. Yay fellow Aries!) 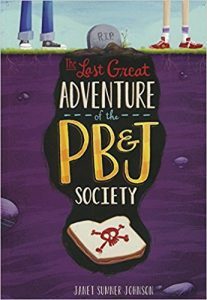 I read THE LAST GREAT ADVENTURE OF THE PB AND J SOCIETY shortly after meeting Janet, and I knew immediately we were destined to by friends. She’s smart, funny, and thoughtful in all the best ways – and so is her book! When her best friend’s house is threatened with foreclosure, young Annie Jenkins is full of ideas to save the home: selling her appendix on eBay, winning the lottery, facing down the bankers . . . anything to keep Jason from moving. But Jason’s out-of-work dad blows up at the smallest things, and he’s not very happy with Annie’s interventions, which always seem to get them into more trouble. But when Annie tracks a lost treasure to Jason’s backyard, she’s sure the booty will be enough to save Jason’s family. Pirate treasure in the Midwest seems far-fetched, even to Annie, but it could be the answer to all their problems. Now all she has to do is convince Jason. As the two hunt for answers and the pressure gets to Jason and his family, Annie discovers that the best-laid plans aren’t always enough and there are worse things than moving away. Humor. It’s funny with lots of laugh out loud moments. A main character who makes mistakes you can relate to. A smart, funny, and realistic handling of tough topics. THE LAST GREAT ADVENTURE OF THE PB AND J SOCIETY is available now. You can pick up a copy online or at your nearest independent bookseller. 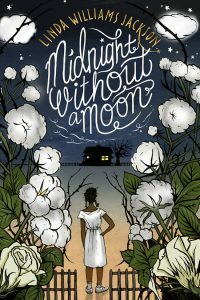 I’ve been wanting to read Linda Williams Jackson’s historical middle grade novel, MIDNIGHT WITHOUT A MOON since I first heard about it early in 2017. I had the good fortune of interviewing Linda for my Author Spotlight series in January of that year, and the story has stuck with me ever since. Which may be why I saved it for so long. (Yep, I was the kid who could make a candy bar last for days if I needed to). I had a feeling it would be rich in character and history as well as beautifully written, and I wanted to be able to dive right into it and read without interruption. I was not disappointed. MIDNIGHT WITHOUT A MOON is a compelling story – told with honesty and grace. Every school should have this book on their shelves. Wonderful and powerful. A tough, lovely, and real story about a young girl growing up in the Mississippi Delta during the 1950’s and struggling to sort out her place in her family and in the world at large. This is a beautiful book – filled with complex characters, sharp storytelling, and rich history. A must read for kids and adults. A brave story well told. A compelling and relate-able heroine. A complicated family structure lots of kids will relate to. An accessible and compelling story about Civil Rights in America. A great book to pair with To Kill a Mockingbird. Some beautiful examples of literary devices such as metaphor, simile, and alliteration. MIDNIGHT WITHOUT A MOON and the next book in the series, A SKY FULL OF STARS, are both available now. You can pick up a copy online or at your nearest independent bookseller. Be honest – you’ve always had a secret desire to stomp around in concrete shoes and fling Frisbees with wild abandon. Well, I’ve always wanted to, and now I have This Book Isn’t Safe to show me how. Colin Furze, five-time Guinness World Record Holder and YouTube’s undisputed king of crazy inventions, instructs fans and curious young inventors on how to build ten brand new wacky inventions at home with an affordable tool kit. Colin Furze’s bonkers and brilliant inventions such as a homemade hoverbike, DIY Wolverine Claws, an alarm clock ejector bed, and Hoover shoes have earned him 4.5 million YouTube subscribers and more than 450 million video views. 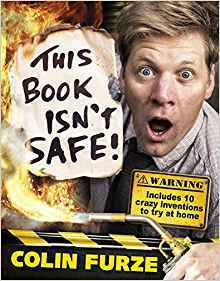 Now Colin is on a mission to inspire a new generation of budding inventors with This Book Isn’t Safe! This Book Isn’t Safe contains instructions on how to make ten brand new inventions with a basic at-home toolkit, alongside behind-the-scenes stories about some of Colin’s greatest inventions and top secret tips and tricks straight from his invention bunker (aka a shed in his backyard in Stamford Lincolnshire). THIS BOOK ISN’T SAFE is more than a handbook. It’s a peek inside YouTube sensation Colin Furze’s invention bunker. It’s filled with information and tips about inventing, YouTubeing, and fun facts about Colin. Plus, it offers 10 do-it-yourself inventions that you can make at home with a fairly limited toolkit and a bit of adult supervision. And despite the title, they can all be done safely (again, with the above-mentioned adult supervision). I would have loved this book as a kid. Heck, I kind of love it as an adult. Colin has an ability to make inventing things look totally do-able – and I trust this book will inspire a generation of young inventors – and let their parents and guardians have a little fun too. A easy-to-read and engaging format. Step-by-step directions with lots of pictures to help guide you. A great excuse to break out the tool box and get your hands dirty creating something with your favorite curious kid. 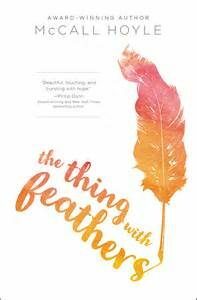 Fellow Class of 2k17 member McCall Hoyle’s debut novel, THE THING WITH FEATHERS, released earlier this month. This is YA at its best – and teachers and librarians are going to want more than one copy of this book on their shelves. THE THINGS WITH FEATHERS is a touching story and a compelling read. Teens will love it – but so will adults. A beautiful book – full of hope. McCall Hoyle’s YA debut captures the fears and excitement of edging past what’s comfortable and safe – and learning to trust the people around you. The writing is lovely and the characters are perfectly drawn – likeable but flawed, and at all times, believable. A school environment/community that teens will recognize. A close look at facing fears and finding your way to acceptance. 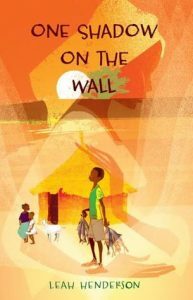 Fellow Class of 2k17 Books member Leah Henderson’s gorgeous MG debut, ONE SHADOW ON THE WALL, released last week. This is a middle grade book you want on your shelves. One Shadow on the Wall is about love and loss, family and friendship, and creating your own future—even if it’s hard to do. ONE SHADOW ON THE WALL is simply gorgeous in every way. I cannot wait to share it with everyone I know. One of the best books I’ve read this year. Leah Henderson’s debut novel is simply captivating. A beautifully written tale of a young boy in Senegal who is determined to keep his family together – despite the very real dangers that come his way. Young Mor is faced with one tough decision after another, but with the help of his neighbors, his friends, and his family, Mor finds the will to not only survive, but to thrive. A gorgeous debut that is a must for every school and library collection. Wonderful sibling and community relationships. Vivid details of everyday life that are compelling. Discussion about doing what’s right even in the face of danger. I AM FARTACUS: The title kind of says it all. I can’t remember the last time I read a book with this many bathroom jokes in it. Maybe never. 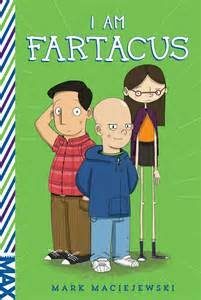 Still, the ARC of Mark Maciejewski’s middle grade debut, I AM FARTACUS, had me laughing right out loud more than once. I’m pretty sure classrooms full of kids are going to be cracking up in 2017. Mark gives us an interesting character in his bald, anti-hero Chub. Bent on revenge against Alanmoore Middle School’s most popular boy, (yep, Alanmoore – and that’s not the only reference to The Watchmen which only adds to the fun) Chub and his cadre of mischief makers plan and prank their way toward justice. But sometimes it’s hard to tell where the good guy ends and the bad guy begins. A funny middle grade debut with a great cast of secondary characters. It’s tough not to like this short, bald anti-hero and his Cadre of Evil. A fun cast of secondary characters. The Colonel may be my favorite adult ever. Pranks, fart jokes, and more pranks. Fun references to comics and movies. Discussion about the fine line between heroes and villains, bullying and getting even. A main character who happens to be an immigrant. A cast with a diverse set of family situations. Another April debut, I AM FARTACUS is released April 18, 2017. It is available for order now at Amazon. 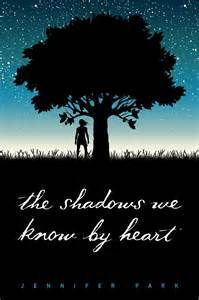 Fellow Class of 2k17 Books member Jennifer Park’s incredible YA debut, THE SHADOWS WE KNOW BY HEART, releases today and it is quite simply the book you did not know you have been waiting for all of your life. Jennifer handles this Tarzan retelling perfectly. She tells this story about love and loss beautifully – with just the right blend of heart and mystery. THE SHADOWS WE KNOW BY HEART is one of my favorite all-time YA reads. I cannot wait to share it with everyone I know. I loved every word of Jennifer Parks’s debut novel. The story is captivating from page one. Park plunges you into the East Texas woods until you feel like you’re part of the story and never want to leave. Great characters, a great setting, gorgeous writing and exactly the right amount of action/tension to keep you turning the pages. A haunting look at love, hope, and the lies we tell, this is a book I can’t wait to read again. A great, true-to-life sibling relationship. A unique retelling of a classic. Flawed and likeable main characters.